changes recently and we are taking an active part in these positive improvements. customised to suit you and your guests and this will be waiting for you upon arrival. etc. Some of the larger supermarkets offer an online delivery service and it is possible to make a food shop either ahead of your arrival or during your stay if you prefer. trainer, yoga instructor. These can all be arranged for you at a day and time that suits you. Luxury comes from within and the interior features and eye catching details of this beautiful space ensure just that. The high end furniture and attention to detail add to the overall asthetics of this stunning home. Central air conditioning (metered) throughout means pleasantly cool in the summer and warm in the winter. Redes is a three story building and this apartment is on the first floor and is accessed by stairs or lift. The building is wheelchair friendly. There is also an intercom security system. 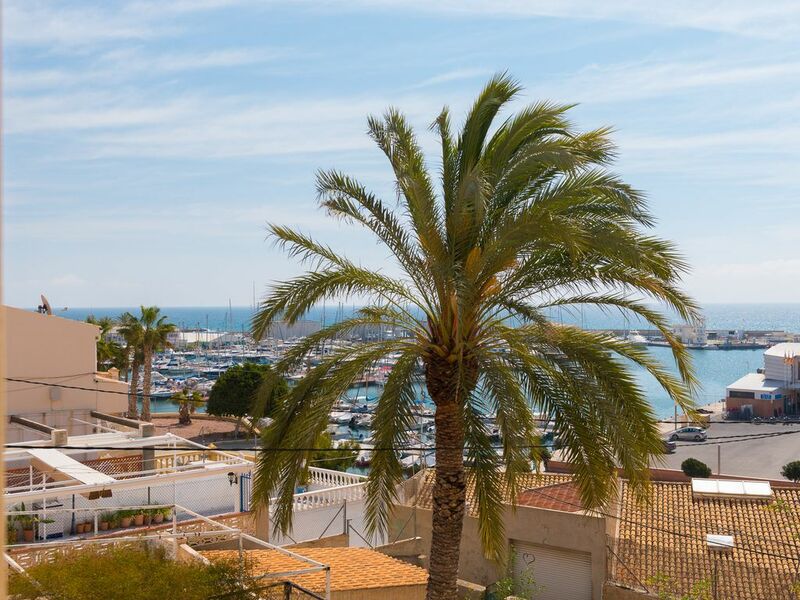 Conveniently located approximately one hundred metres from Campello beach front and the Marina. Along the promenade are bars, restaurants, shops etc. Alicante airport is a 20 to 25 minute drive away. Bus, tram and train stations are also within easy walking distance. Alicante city and Benidorm are easily reachable by public transport. Leading from the hallway is the well appointed kitchen on the left. It is fitted with fridge freezer, dishwasher, washing machine, microwave, coffee machine, toaster and electric kettle. A four ring electric hob, built-in hob and extractor fan. There is also a small courtyard off the kitchen with a storage area and washing line. The lounge and dining area have all day sun. It is super spacious and very comfortable with high quality furniture and fittings. The T.V. provides a good choice of programmes and there is unlimited WiFi throughout. There is also a DVD player available. There is a sun blind for shade on the balcony plus persian blinds and sliding roman blinds that set off the large french windows leading to the balcony. The main double en-suite bedroom is south facing and is extra spacious at 32 sq metres with high ceilings, a view of the harbour and a door leading to the balcony. All the furnishings are new and there is plenty of built-in storage and a full length mirror. The generous en-suite bathroom has a bath with overhead shower. Bedroom two has two single beds, ceiling fan, bedside locker, bedroom chair, fitted wardrobe and a sliding door to the courtyard. Bedroom three also has two single bes, bedside locker, fitted wardrobe, a standard fan and a sliding door to the courtyard. The second bathroom has a large shower, toilet and sink with cupboards under. There is plenty of parking directly outside the building. FAMILY DISCOUNTS - Enjoy a family fun day out with a visit to Terra Natura, Terra Mitica or Aqualandia near Benidorm. María de la Paz G.
Hemos pasado dos semanas en este piso con dos niños y un anciano. El apartamento está muy bien situado, encima del puerto, a un paso de la playa y el paseo y a 5 minutos de todos los servicios. A pesar del ruido durante las fiestas, las ventanas y persianas aíslan lo suficiente, hemos dormido muy bien. Hay ventiladores de techo en dos habitaciones, más uno de pie en la tercera habitación, y aunque el aire acondicionado funciona con monedas, al final casi no ha sido necesario utilizarlo. La casa tiene todo lo necesario para una estancia cómoda, aunque quizá harían falta más platos y vasos normales para evitar hacer un uso excesivo del lavavajillas. Hay un edificio delante del balcón que bloquea parte de la vista, pero se ve el mar desde el balcón y el puerto desde la habitación principal, y hemos podido disfrutar de los fuegos artificiales desde el balcón. El único punto negativo han sido los olores que suben a mediodía y a la hora de cenar desde el restaurante que se encuentra justo debajo. El manager (que habla inglés) ha estado muy atento y disponible cuando lo hemos necesitado. Tuvimos un problema con la televisión (ahora hay canales en inglés y español) y no había Internet cuando llegamos, pero en un par de días estaba todo arreglado. En resumen, muy buena experiencia, un apartamento muy recomendable.